Inhalt: Die „alpine Stadt”: Bemerkungen zu Forschungsfragen und wissenschaftlichen Perspektiven – eine Einleitung – Zum Forschungsstand: Alpenstädte – De l’Identité alpine et des Villes des Alpes: Quelques éléments de réflexion sur la valeur et la nature de l’identité urbaine – Das Stadt-Land-Kontinuum im Alpenraum: Methodenvergleich zur Abgrenzung von Stadtregionen in verfingerten Raumsystemen – Globalisation et identité dans le sud de l’Arc Alpin: les Alpes-Maritimes et Nice – Die Internationalisierung des Tertiären Sektors: Metropolen des Alpenraumes im europäischen Städtesystem – Les destinations touristiques ex-claves des villes – Alpenstadt 2000 : Regionale Transformationsprozesse im Spannungsfeld von Wettbewerbsfähigkeit und Kohäsion. Being amongst the small and medium-sized towns, the urban centres of the Alpine region have long tended to be on the margin of academic interest. It is only recently that transnational research projects have considered issues of settlement development, quality of life and the intelligent use of limited resources. The research report on the “Alpine town” represents an introduction to the topic, with academics of varying research interests and from different countries of the Alps presenting perspectives on urban research in the Alps. 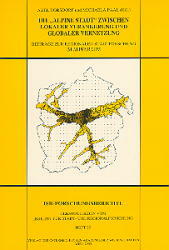 Attention is paid to the question of the delimitation of urban regions in the many branches of the Alpine valleys, and the perception of Alpine identity by the inhabitants, the role of tourism with its geo- graphical and socio-economic consequences, the involvement of the cities close to the Alps in the European system of towns and the regional transformation process in the field of tension between competitiveness and cohesion.